Hot Off the Press! Really. | The Better Plan . . Hot Off the Press! Really. 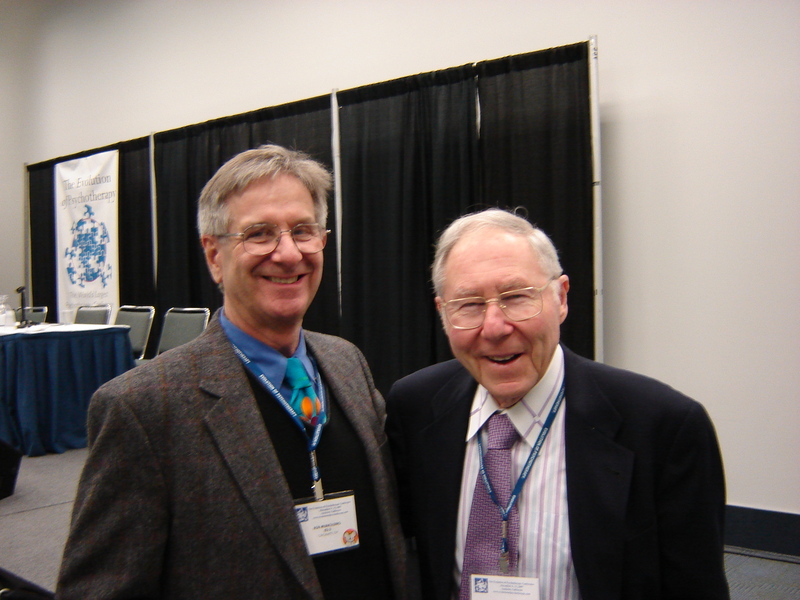 Bob Wubbolding, who wrote the Foreword for the biography, and Glasser at the Evolution of Psychotherapy Conference in 2005. The book is listed at $22.95, but is being sold right now for just $22.00 on the publisher’s website. Buyers are given the option of giving a $5 donation, along with their book purchase, to the William Glasser International organization. It is a very simple process and a nice touch, I think. William Glasser did not just have a profession, he had a mission—to empower people through choice, free will, and self-determination. He envisioned a better world, and the weighty issues he tackled reflected that—the definition, diagnosis, and treatment of mental illness; the explosion of psychotropic drugs; addiction and self-medication; failing marriages and the high divorce rate; disconnected families; crime and crowded prisons; underachieving students and marginal schools; and worldwide political oppression and violence. Jim Roy chronicles the life and legacy of William Glasser whose controversial ideas and brilliant insights significantly impacted mental health and education professionals. Champion of Change illustrates Glasser’s lifelong dedication to help others lead productive, meaningful lives. Although Glasser was already gaining recognition in the early ‘60s with the publication of his first book, Mental Health or Mental Illness, his notoriety changed significantly after his second, Reality Therapy (1965). Working as psychiatrist in the late ‘60s at the Ventura Schools for Girls, a school for troubled teens, Glasser’s professional life really began to take shape as his ideas were implemented, dramatically changing and reforming young women who most had given up on. His long and successful run at the school prompted another book, Schools Without Failure (1969), which is still a bible to many present-day educators. Over the next four decades Glasser published 23 books and a slew of booklets and articles, and was interviewed and written about in myriad books, magazines, and journals. The principles and concepts he held and generously shared and articulated through his books and public speaking were reality therapy, control theory, choice theory, and mental health as a public issue rather than a medical issue. The latter being the most controversial in that Glasser swam against the tidal wave that swept in the growing belief that drug therapy should supersede talk therapy. Also captivating is Glasser’s personal life – his own dysfunctional family history, the family losses he endured, and his quest to find love again. And through it all he selflessly continued to work to change the bigger picture. In the introduction of William Glasser – Champion of Change, it’s stated that novelist Thomas Berger once said writers write because “it isn’t there,” and Jim Roy takes that to heart giving us a comprehensive and compelling biography on voice that will surely echo throughout history. You may have noticed that twice in the promo the biography was referred to as Champion of Change. The layout editor of the biography somehow got that phrase in his mind early on in the process and it continues to show up at various times. My wife thinks that Champion of Change might actually be a better title, but Champion of Choice has won out so far. Kim Daub Olver, current Executive Director of Glasser International, shared on Facebook yesterday that she feels the book will be a huge contribution to the world. To that I say, I hope so. It would be so cool if the biography really made an impact on people’s thinking and acting. Enjoying The Better Plan blog? Why not click on the Follow link and receive updates as they are posted. You also have my permission to tell family and friends about the blog. We all could use an insight now and then on living a non-coercive life. This is wonderful and very exciting! The forward thinking and cooperative teachings of Jim have molded my life, I look forward to reading this book. Really good to hear from you, Matt. And thank you for your kind words. Thank you, Karen. That I could work closely with Bill Glasser was indeed a privilege. I shall always consider it so. I hope the biography in some way captures the ideas and the ideals that he shared throughout his life.